I started by tracing out the shape of the body of the guitar with the paper template I’d made, aligning the center of the template with the center seam. 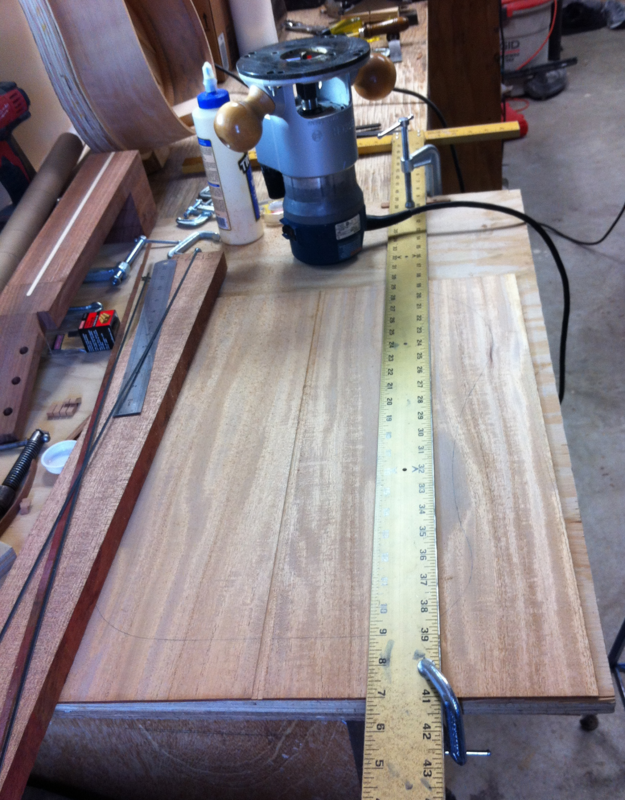 I then used a router to make a channel half the depth of the back plate for the center seam inlay to rest in. 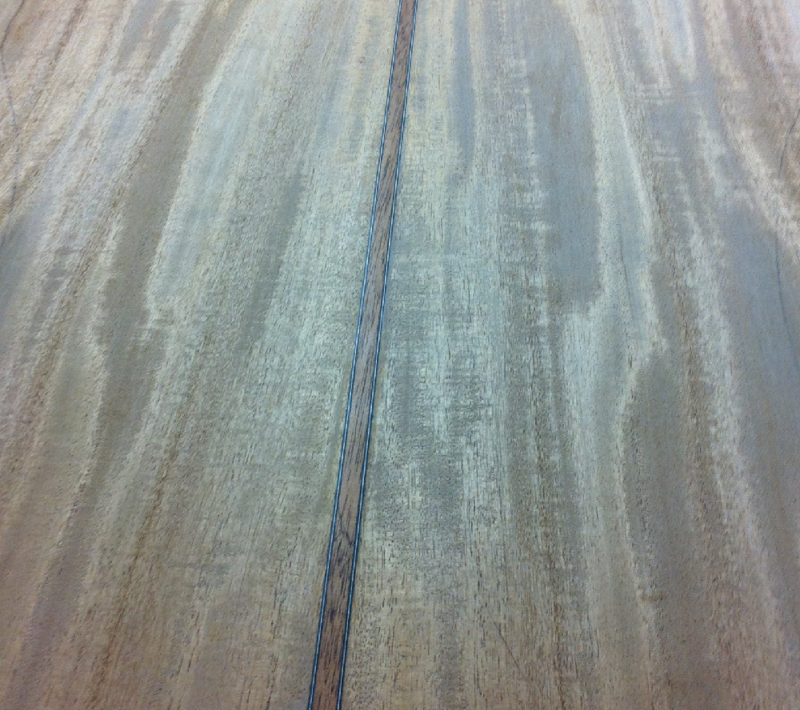 I went through a couple of iterations of channel widening with the router (I added strips of masking tape to the edge of the router plate as I had done to make the channel on the neck) until I was able to get the inlay to dry fit snugly, but not too tightly, into the channel as shown below. I made the inlay by combining a strip of black/white/black laminate with a strip of sipo mahogany (that was the same stuff I made my neck out of, I found it was cheaper to just buy a chunk of sipo mahogany and cut my own strips of binding rather than buying pre-made binding, and plus it matched well with my neck wood) and another strip of black/white/black laminate. I then glued them in and planed and scraped it all down nice and flush. I was quite pleased with how the colors turned out. 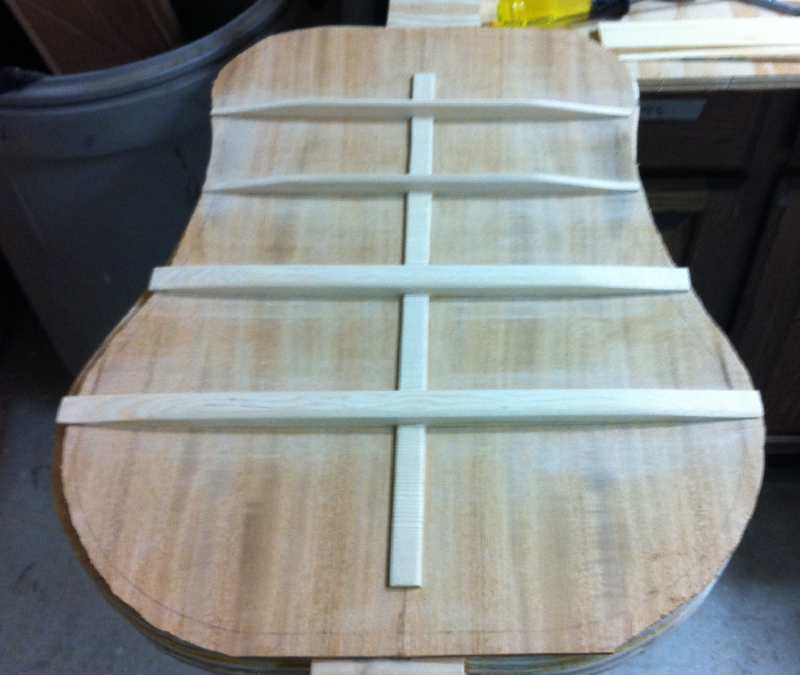 With the center seam inlay completed I then moved onto the back bracing. 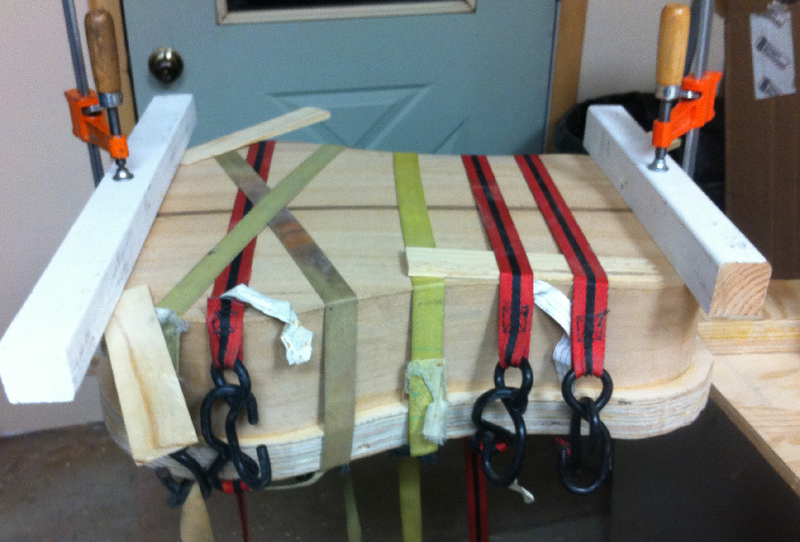 Unlike the soundboard bracing I made all of the back bracing at once and dry fit it together before gluing any of it on. 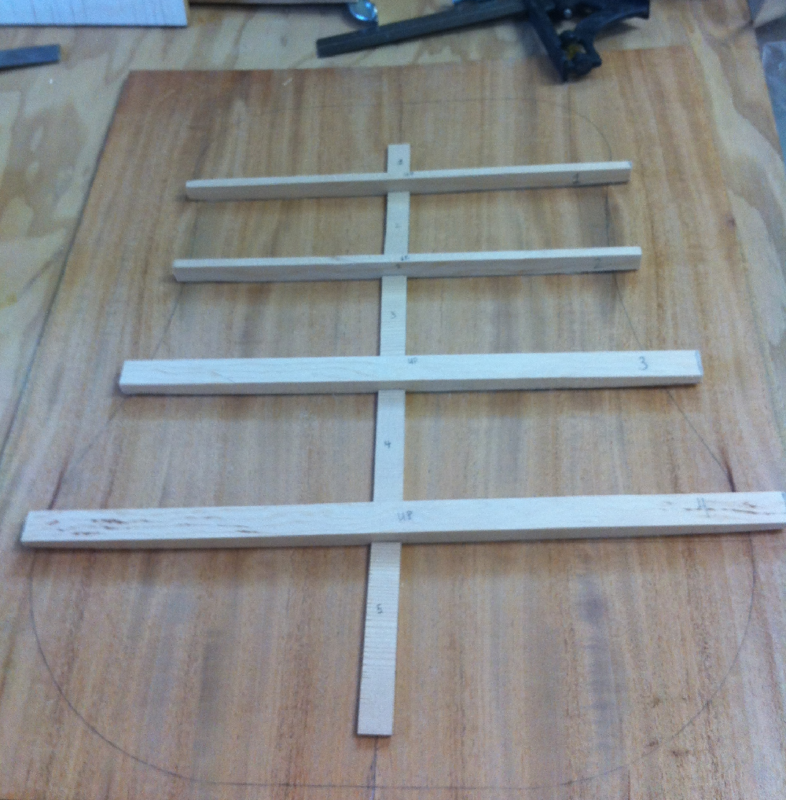 I followed the bracing outline suggested by Natelson and Cumpiano, which basically consisted of four horizontal braces with thin pieces of wood in between the four braces to strengthen the center seam (I used srips from my leftover soundboard material). The four braces I used were arched to give the back an arch. I marked out the arch curves on the back braces using the same springy metal rod technique that I used to mark out the soundboard curves and then actually arched them using a belt sander with a squared up guide. It went smoothly. The braces are shown below dry fitted together. Before I glued them on I cut out the body with a coping saw leaving about a 1/2 inch of extra material from the line. I then glued the braces down and once the glue had dried I carved the braces out with a chisel and sand paper. The result is shown below. 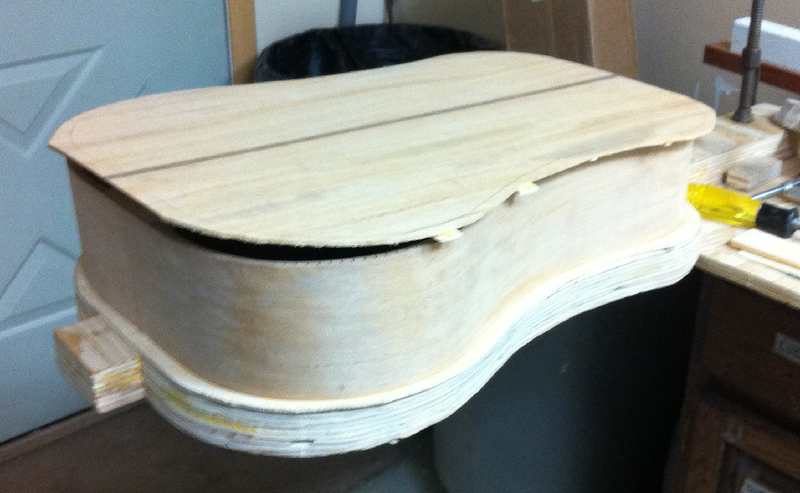 By this point I was starting to get excited – my next step was to glue the back plate to the soundboard and sides. The body was really starting to take shape. To attach the back, I first had to notch out the kerfing to make room for the back bracing, just as I had done for the soundboard bracing. To do this I simply set the back on top of the body, exactly where I wanted it to be and drew pencil marks on the sides of the guitar where the braces intersected, as shown below. 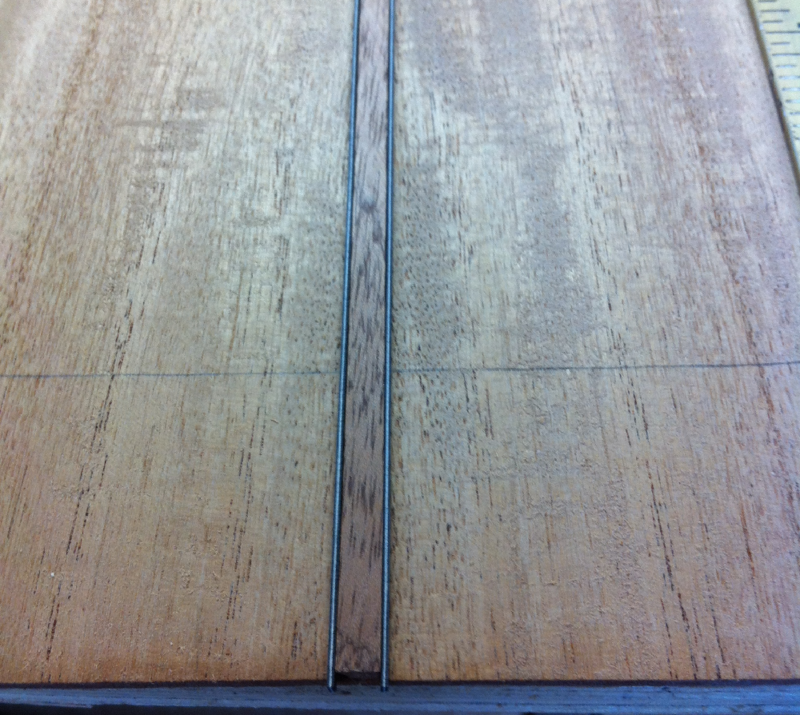 Then I used a thin dovetail saw to make notches in the kerfing and cleared away the rest of the material with a chisel. After that I trimmed the back braces so that they could be inserted into the notches. I kept taking the back on and off until I got a perfect fit. Once I got the back bracing to fit into the notches with the back perfectly centered I proceeded to glue the back plate on as shown below. I made sure to clamp the tail and head blocks well and used straps to secure the rest of the back plate while the glue dried. It is pretty important to make sure the back plate has been perfectly trimmed down to the shape of the body so that there is no overhang. In my first attempt at strapping it down I left about a 1/4 inch of an overhang and the plate broke clean off right at the edge of the body, I got really lucky. The last step in the construction of the body was the installation of the binding. I discuss that next.